Window Wizard -pair of microfiber pads. One removes bugs from windshield, the other dries. Wash in a Wool Shampoo and vinegar mixture for best results. NOTE: Kit does not include Fiberglass Extension Pole. Please order separately. All items attach to Acme threaded handles. 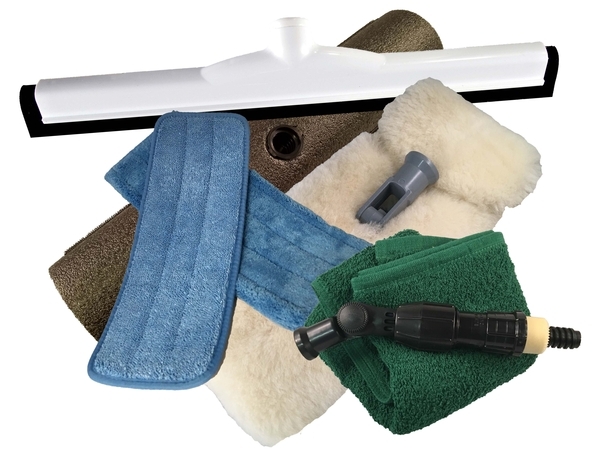 Safely wash and dry RVs, motorhomes, trailers and toy haulers from the ground with our earth friendly Genuine Lambswool Wash on our 4-way swivel pad holder. Dry quickly to prevent water spots using our EZE squeegee followed with a terry towel over the Super Cleaning Head. The "velcro" type hook fasteners hold your towel in place so they don't fall in the dirt. Wash your RV with the Lambswool Wash, baby shampoo and food grade distilled white vinegar in sections. The Window Wizards clean and dry windshields.